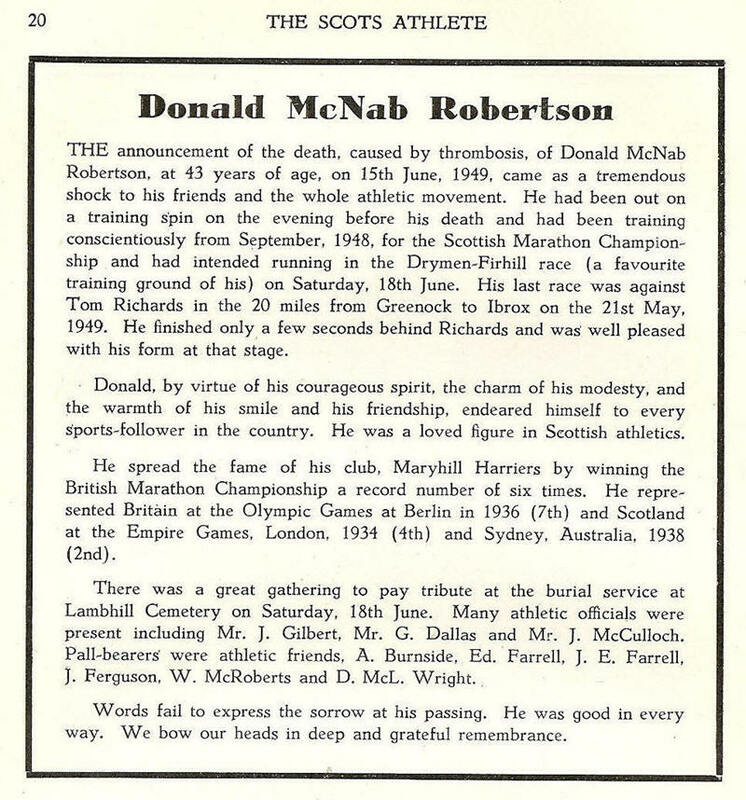 With six AAA’s marathon championship victories and the winner of the first two SAAA marathon championships, two Empire Games selections and an Olympic selection, Donald MacNab Robertson of Maryhill Harriers has to be considered one of Scottish marathon running’s greats. When you consider that all, except for the the SAAA wins, were done in the period between 1932 and 1939 his claim to greatness is enhanced even further. Born in 1905 he came late to the sport and first came to the notice of the wider athletics world when he won the AAA’s marathon title from club mate and friend Dunky Wright. Arriving at the track together Robertson won the sprint – as he was to do in many races – to be victorious by by only 1.4 seconds. This was only the first of a series of wins in 1932, 1933, 1934, 1936, 1937 and 1939 and in 1946 (the first post war race) he was only just outsprinted to finish second in what was virtually a dead heat. In other words he failed to get a seventh AAA’s title by 0.2 seconds. In 1932, having won the AAA’s he was selected for the Los Angeles Olympic Marathon where Dunky Wright, whom he had beaten at home, was fourth but unfortunately work and family commitments meant that Donald could not accept the selection. His winning time in the AAA’s of 2:34:32.6 placed him eighth fastest in the world that year and was to be his lifetime fastest time. He won again in 1933 in 2:43:13.6 and in 1934 his winning time was 2:41:55. He also ran in the Empire Games for Scotland that year and finished second only one place ahead of Dunky Wright. He did gain selection for the Berlin Olympics in 1936 after possibly the most exciting of all his victories in the AAA’s marathon championship. This time he entered the White City Stadium with Ernie Harper of Hallamshire Harriers but Robertson again showed his sprinting strength and skill to win by 1.2 seconds in 2:35:02.4 which ranked him twelfth in the world at the end of the season. In Berlin he was always up with the race although he never took the lead at any point and finished seventh in 2:37:06.2 which was the twenty third time in the world. The times are an indication of how tough the competition was – there was only a two minute gap between the times but a ranking difference of 11 places. Incidentally Ernie Harper was a close second in the race. In 1937 his best time of 2:37:19.2 was good enough for thirteenth in the world. His only run of significance in 1938 was in the 1938 Empire Games in Sydney where he was fourth in 2:42:40.0. In 1939 he won his sixth AAA’s title in 2:35:37 (good enough to be twelfth in the world) after which there was an unfortunate career break until 1946. 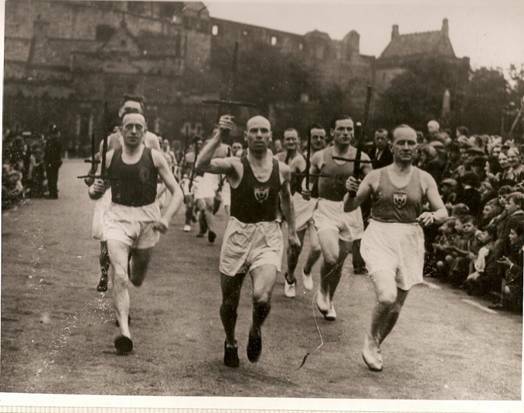 By 1946 the Scottish Marathon Club had been founded and had forced the SAAA to hold a Scottish Marathon Championship. Needless to say the almost 40 year old Robertson won from 50 year old Wright in 2:45:39. In the AAA’s marathon that year he was second after another last lap sprint at the White City only losing out by 0.2 seconds to Squire Yarrow in a time of 2:43:14.6. Remember that this was just after the War and food was still quite severely rationed and shoes in particular were hard to get. First of course you needed the money but in the second place clothes could only be bought if you had enough clothing coupons. Coupons used on running shoes could not be used on other items of everyday clothing and it was a case of ‘make do and mend’ to quote a slogan of the times. A year on and he again won the Scottish title, this time in 2:37:49 and was third in the AAA’s in 2:37:58. These two times were the nineteenth and twentieth in the world that year. A couple of comments: (1) It should be noted when looking at rankings in the post war period that the principal rivals in endurance events – the Scandinavians and the Americans – had not suffered the privations of the war and were not enduring rationing. If you read Joe Gallo’s columns from Australia or read George Barber’s columns in ‘The Scots Athlete’ you will have read of food parcels being sent to Scottish athletes from Australia and from America so that they could compete on equal, or nearly equal terms. In that situation to be ranked in the top twenty in the world was no small feat. (2) When looking at times remember that marathone as a sun screen! Venue? Centre Parcs! Regardless of the miles put in or the number of titles won or major Games medals, he was reported to be a thoroughly nice man, like by everybody. I knew many Maryhill Harriers and none of them had an even mildly critical comment on him as a person.